This exquisite Colonial Revival home was built in 1905 by Cornelius Daly for his wife, Annie, and their five children. Conn Daly and his brothers founded Daly Brothers Department Stores which flourished on the North Coast of California for over one hundred years. The home has four fireplaces, lovely Victorian gardens, and is furnished with antiques reflecting the charm of the early 1900's. 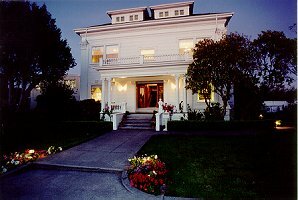 This bed and breakfast mansion is truly one of this area's finest examples of turn of the century elegance and should not be missed. The Bed and Breakfast is known for wonderful breakfasts and making guests feel at home in a quiet, romantic atmosphere. Eureka's Old Town with its wonderful shops and restaurants is within walking distance. The Redwood National Park and the Pacific Ocean are only minutes away. Come for a visit....you will love it.